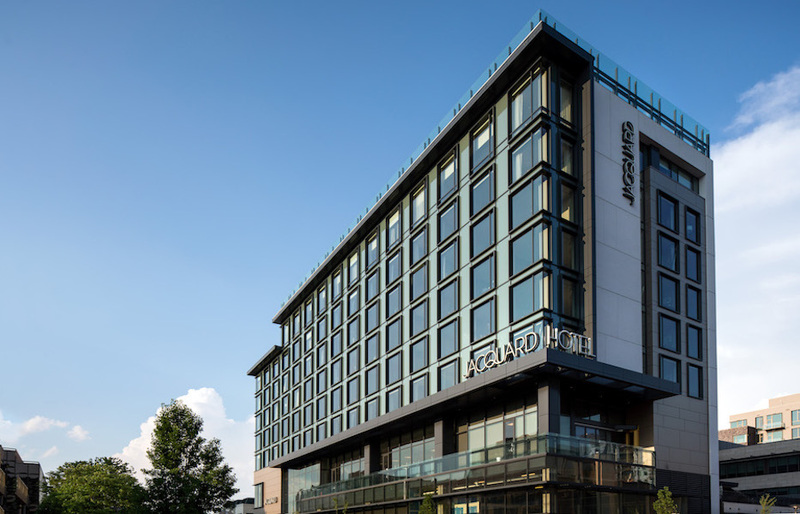 Autograph Collection Hotels, together with Stonebridge Companies, one of the nation’s leading ownership, management and hospitality development firms, officially opened the doors to The Jacquard Hotel & Rooftop located in the heart of Denver’s iconic Cherry Creek neighborhood on Wednesday, Oct. 3, 2018. The hotel joins the brand’s diverse portfolio of more than 140 one-of-a-kind hotels that champion visionary owners, thoughtful design and craft. The Jacquard is a sophisticated, 201-room hotel where guests can enjoy walkable access to more than 50 bars and restaurants, as well as world-class shopping at independent boutiques and well-appointed brands alike. “We are excited to welcome our second Autograph Collection Hotel in Denver and third in Colorado with The Jacquard, which remains true to the brand’s promise of delivering an exactly like nothing else experience,” said Jennifer Connell, Vice President, Brand Marketing & Management, Autograph Collection Hotels. The Jacquard will delight guests with spirited celebration through fun touches such as a split of bubbles in every guestroom to make impromptu celebrations easy. Tailor-made experiences abound with thoughtful and personalized amenities such as child-sized bathrobes for The Jacquard’s tiniest guests and access to the best personal stylists in the neighborhood to ensure guests’ shopping experiences are memorable. Enhancing refined service, and delivering it with style, The Jacquard’s guests are transported in its Tesla Model X house car, providing complimentary and available-on-demand transportation 24-hours a day, while the hotel’s team of Curators – in-the-know individuals – provide guests with memorable experiences in three key areas: Style, Celebrations and Service. Through these tailor-made experiences, spirited celebration and service delivered with style, The Jacquard aims to bring a bit of “Haute Happiness” to life for each guest. The Jacquard is easily walkable to premier shopping, dining and entertainment in the Cherry Creek neighborhood. With an impressive collection of art galleries, independently owned boutiques and international fashion brands – all located along pedestrian friendly, tree-lined streets – Cherry Creek is home to nearly 600 businesses. Pampering abounds at the many luxurious day spas, medi-spas, and salons, while elevated dining experiences can be found around every corner. Home to the Cherry Creek Shopping Center, Denver’s upscale retail destination, visitors can take advantage of the 160 stores, 40 of which are exclusive to the area. With Cherry Creek being one of Denver’s most walkable neighborhoods, The Jacquard boasts a Walk Score® of 94, designating the hotel as “A Walker’s Paradise,” meaning cars aren’t a necessity for guests staying at the hotel. The Jacquard offers one-of-a-kind, urbane spaces with 6,900 square feet of light-filled meeting and event space, providing an inspired and unique location for any function. The meeting and event space floor-to-ceiling windows and access to a wrap-around balcony allowing Denver’s fresh, crisp air in. With flexible space and breathtaking views, The Jacquard’s rooftop and 75-foot pool, complete with a translucent cover for events, is a distinguished venue for a multitude of celebrations, from weddings to fashion shows and galas. Narrative, the restaurant steps away from the hotel’s lobby, provides guests with storied food and drink from award-winning Executive Chef Paul Nagan. Narrative’s approachable menu features modern American dishes, globally inspired shareable plates, a robust happy hour and more. A diverse wine library featuring nearly 100 selections, blending Old World and New, complements the menu, while two dining rooms are available for groups as well as private experiential dining. Narrative’s inviting atmosphere, with an outdoor patio, floor-to-ceiling windows and high ceilings, will bring guests back time and time again. With sweeping 180-degree views of the Rocky Mountains and downtown Denver, the hotel’s rooftop has promise to become the new centerpiece of the neighborhood with its pool and rooftop bar, Kisbee on the Roof. Dabble, The Jacquard’s unique, outdoor pop-up space includes a fire feature for guests to enjoy and take in beautiful Denver evenings, while providing a taste of Cherry Creek’s popular patio culture. From premium bath linens by Italian fine linen brand Frette, to in-suite exercise bikes by Peloton that bring a private indoor cycling studio to guests’ suites, The Jacquard transports guests to a world of refined enjoyment with each thoughtfully curated amenity. Vero Water® hydration stations and in-room reusable glass bottles allow guests to choose from sparkling or still water to refill their glass carafes, and Gilchrist & Soames’ sophisticated London Collection® of bath amenities are offered in each room. For more information, and to make reservations, visit TheJacquard.com or www.autographcollection.com, or follow The Jacquard on Facebook and Instagram.